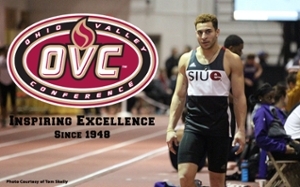 SIUE's Julian Harvey, of Edwardsville is the 2017 Ohio Valley Conference Male Indoor Field Athlete of the Year for the second straight year. The award comes as the senior attends his final OVC Indoor Track and Field Championship Friday and Saturday in Charleston. Harvey enters the meet No. 1 in the nation in the long jump with a leap of 26 feet, 5.5 inches at the Tyson Invitational. That mark also is the longest by an American this year and the third farthest jump in the world. He also holds the top spot in the OVC in the high jump with a mark of 7-0.25. Harvey is second in the triple jump with a leap of 50-6.75. Harvey expects to compete in all three events this weekend.